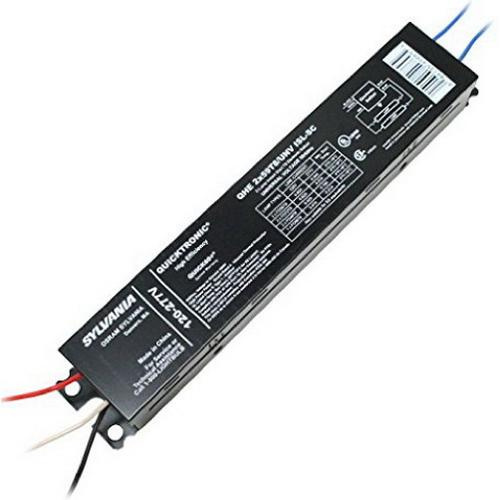 Osram Sylvania Quicktronic® PROStart® High-efficiency electronic fluorescent ballast is suitable for use with two 28-Watt FP28 lamps. It has voltage rating of 120 - 277-Volts and current rating of 0.53/0.23-Amp. Programmed rapid start ballast with 0.01/1 ballast factor, offers greater than 98% power factor. It features type 1 outdoor enclosure. It has series lamp connection. Ballast operates at the frequency rating of 50/60-Hz. It provides Class P protection. Ballast measures 16.7-Inch x 1.68-Inch x 1-Inch. It features QUICKSENSE® ballast technology. It withstands temperature rating of 70 deg C. Ballast is UL listed, CSA certified and RoHS compliant. * Inventory displayed is accurate as of 04/22/2019 02:40 PDT.